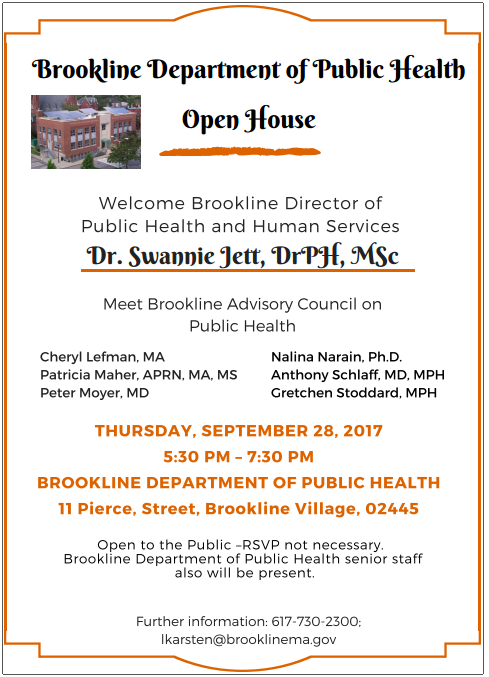 On Thursday, September 28, 2017, the Brookline Department of Public Health will host an Open House at 11 Pierce Street, 5:30 – 7:30 p.m., to welcome its new Director of Health and Human Services, Dr. Swannie Jett, DrPH, MSc. Dr. Jett was appointed Director in April 2017, having most recently served as Director of the Seminole (Orlando) County, FL Health Department. In inviting the community to the Open House, Dr. Jett noted, “This is a great opportunity for residents to visit the Health Department, learn more about what we do, and bring any concerns about how we can serve the community better”. Joining Dr. Jett at the Open House will be members of the Advisory Council on Public Health whose current appointees include Brookline residents: Cheryl Lefman, MA; Nalina Narain, PhD; Patricia Maher, APRN, MA, MS; Anthony Schlaff, MD, MPH; Peter Moyer, MD; and Gretchen Stoddard, MA. Senior staff members at the Department of Public Health also will be present. Residents, town employees and local businesses are invited to attend. Light refreshments will be served. For further information, please inquire with Lynne Karsten at 617–730–2336 or by e-mailing her at lkarsten@brooklinema.gov.